Huawei has always been quick at embracing new design trends. The Nova 3 is no different. New Delhi: Huawei has been on a roll. The Chinese firm has worked its way into the top five smartphone vendors’ list in India—riding on the popularity of its Honor sub-brand—in the first quarter of 2018, (as per Counterpoint Research). 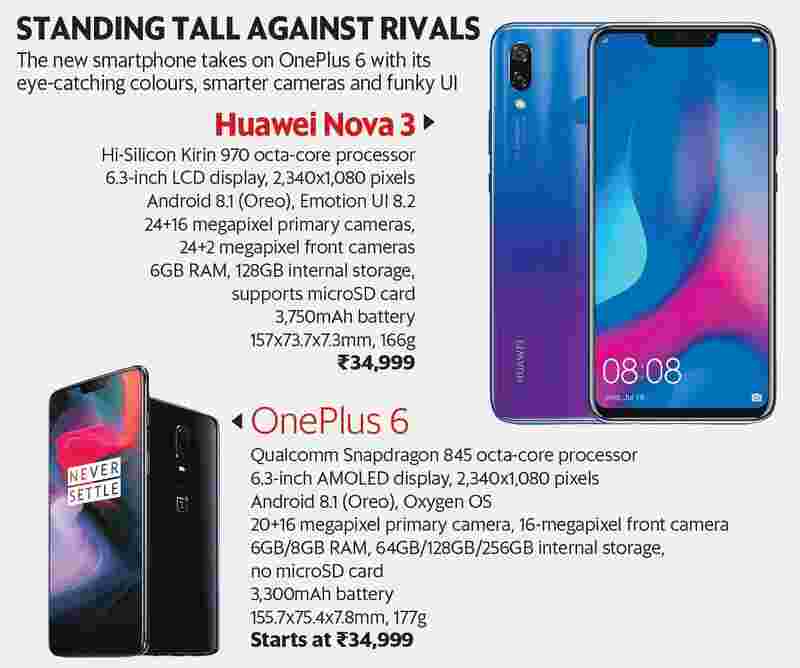 The company is now pushing its smartphones such as Nova 3 (₹34,999) under the Huawei brand. Design: Huawei has always been quick at embracing new design trends. The Nova 3 is no different. It has very thin bezels below and a small cut-out called notch at the top of the screen, just like One Plus 6. However, the Nova 3 looks more eye-catching due to iris purple finish on the glass back. Display: The 6.3-inch screen looks bright, offers a vivid mode to improve colour saturation and contrast, and has a resolution of 2,340x1,080 pixels. However, the OnePlus 6 has more vibrant display with richer colours. Software: The Nova 3 smartphone runs Android 8.1 with the trademark Emotion user interface (UI) on top. It is a polished-looking UI that allows users to tinker with the interface in more ways than OnePlus 6’s OxygenOS, a version of the Android mobile operating system. Performance: Unlike the OnePlus 6, which runs on the latest Qualcomm 845 chipset, Huawei Nova 3 has been saddled with last year’s Kirin 970 chipset. While its benchmark scores are much lower, there is no perceptible difference in day-to-day use. It doesn’t feel like a drag at any point and was able to glide through heavy tasks and games with ease. Camera: The Nova 3’s dual cameras use AI (artificial intelligence) to recognize a scene and enhance picture quality by tweaking the settings for best results. Landscape shots look a lot more detailed and alive than similar shots taken with the OnePlus 6’s dual cameras. Verdict: With the Huawei Nova 3, users get more storage (than the similarly-priced variant of OnePlus 6), better camera, more customizable UI and some breathtaking colour options. The OnePlus 6 has a richer display and less-cluttered interface.